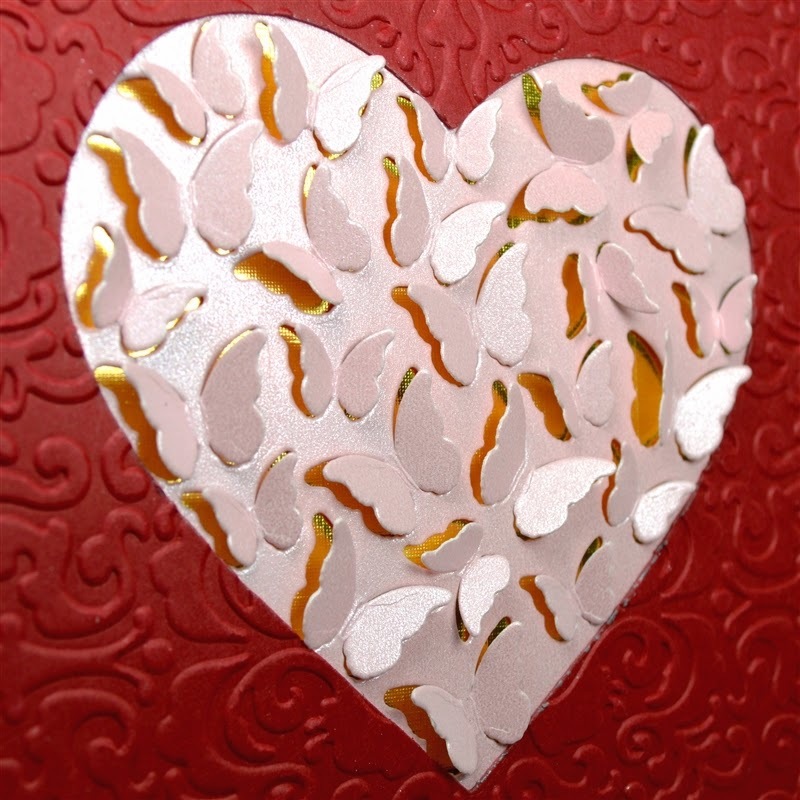 Valentine cards are so much fun to make. 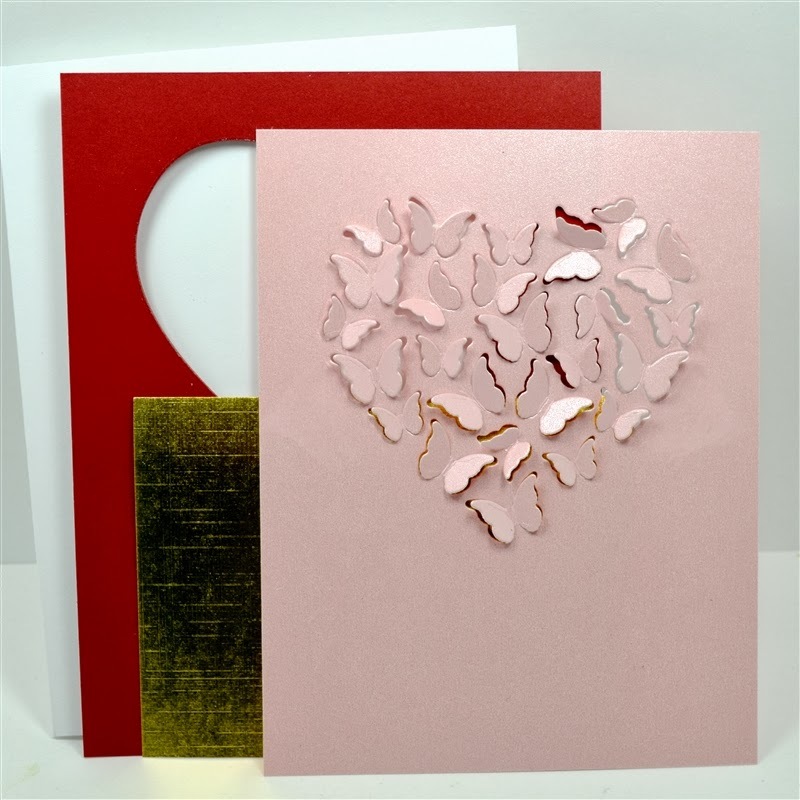 There are lots of types, from the cute kid valentines exchanged in school to the super elaborate multi-layered lace and bead creations dripping with vintage elegance. 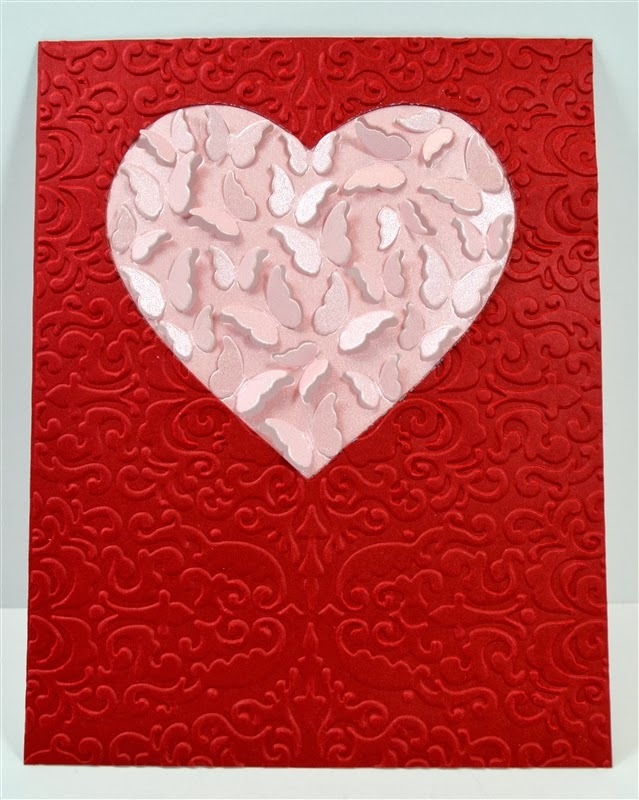 I eventually get tired of red and pink but I do love making valentines. If you have been reading my blog for a while, you know that I have a slight (well more than slight) "addiction" to the Memory Box dies. Every time new dies are released I am like a kid in a candy shop. I just bought this butterfly heart die and I couldn't wait to try it out. 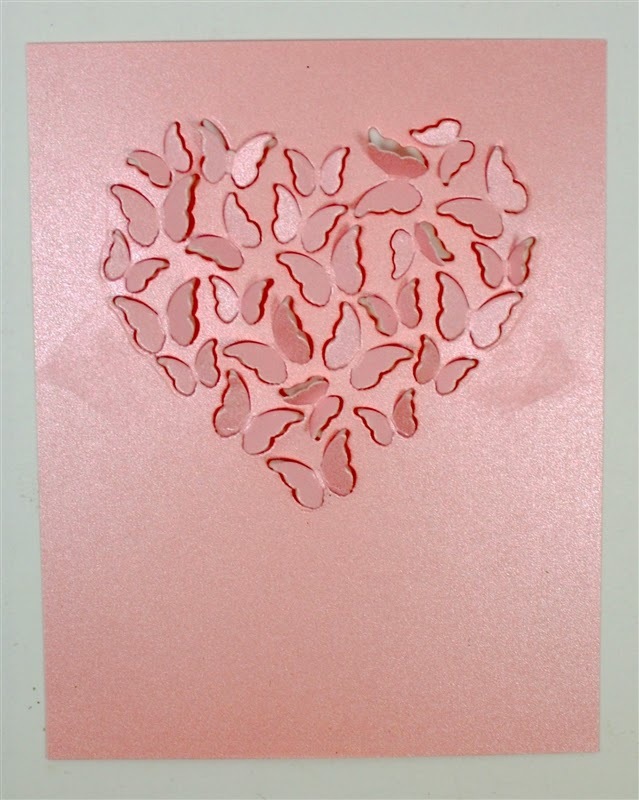 My first Idea was to simply cut the heart shaped group of butterflies into the front of a pale pink shimmer card and add embellishments. I wanted to keep the die centered so I taped it to the cardstock (total fail! - I forgot that I actually bought the Sizzix magnetic plate so I wouldn't have to do this...!). 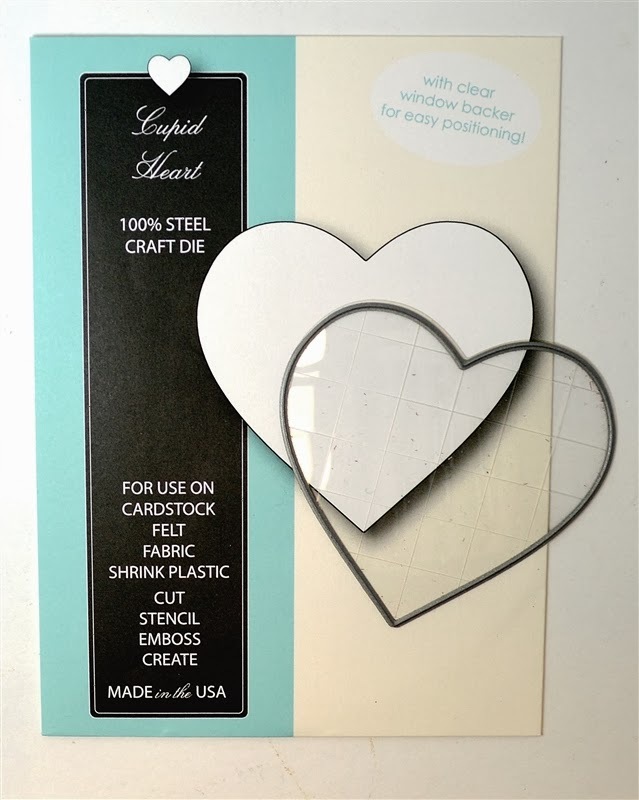 The tape left marks on my card front so I moved on to Plan B.
Fortunately, I already own the die that coordinates in shape to the butterfly heart - it is called the "Cupid Heart" and it matches a few other heart dies from Memory Box. 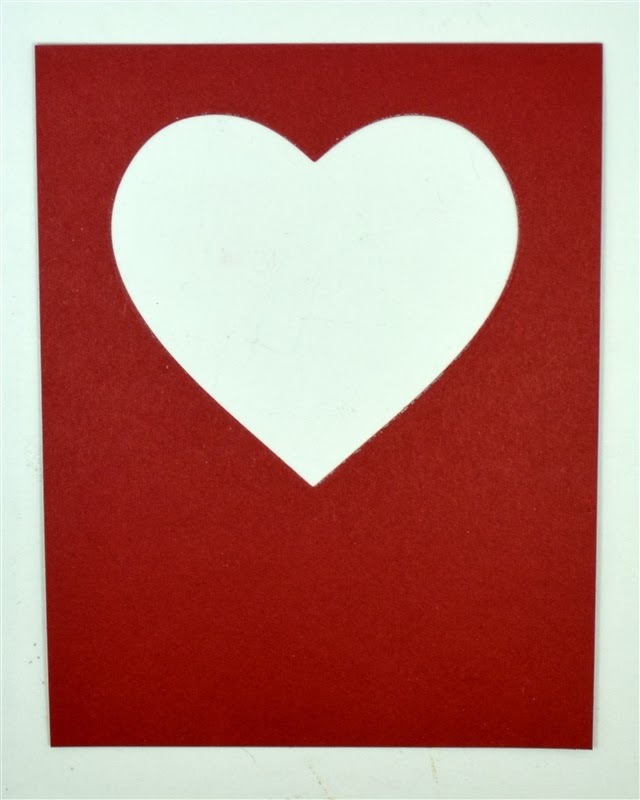 I cut a heart shape in the center of a 5 1/2 x 4 1/4 piece of red cardstock. This overlay fits perfectly around the butterflies. I trimmed the pink cardstock to be a bit smaller than the red card top. 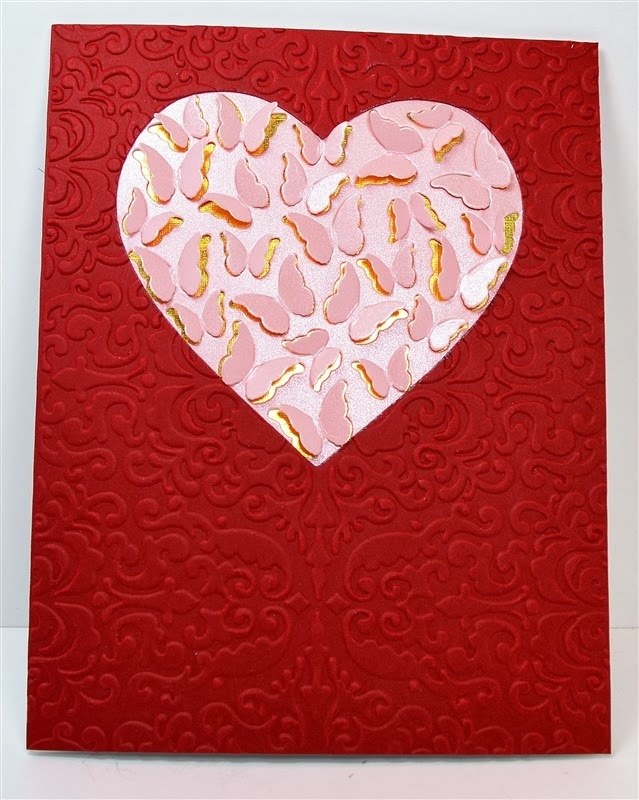 I thought the plain red cardstock was a little too simple for a Valentine so I looked through my Anna Griffin embossing folders. 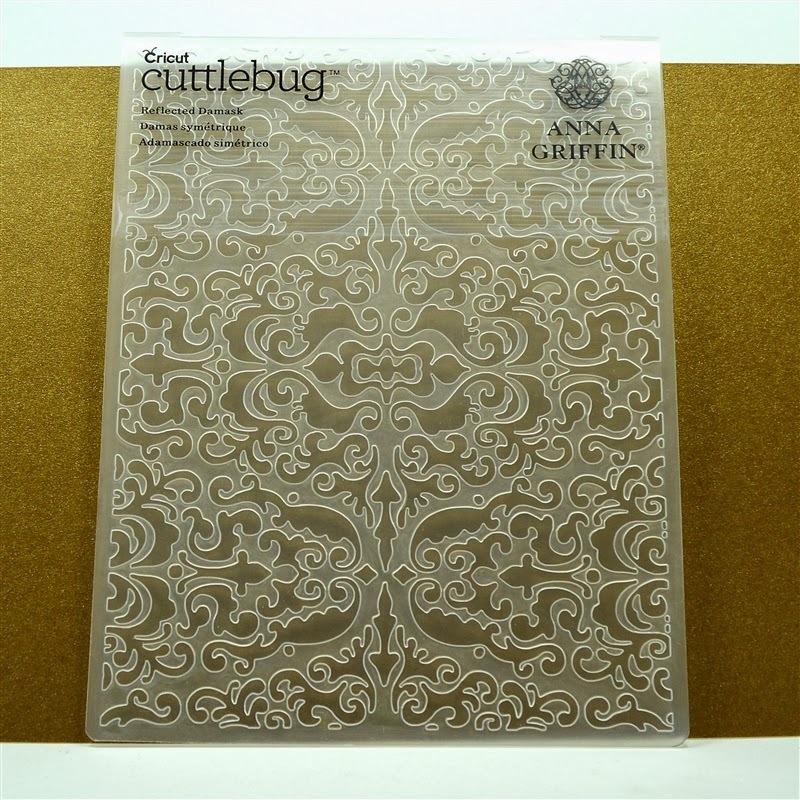 I was sure that there would be one that would work nicely for this card and the "Reflected Damask" was just what I was looking for. The symmetrical pattern lined up perfectly with the heart cut-out. These folders cover the full front of an A2 card. I usually make my card toppers a little smaller than the card to leave a thin border but I decided to show off the entire embossed design and have the topper completely cover the white card front. I used 1/8 inch ScorTape to adhere the overlay to the pink butterfly layer. 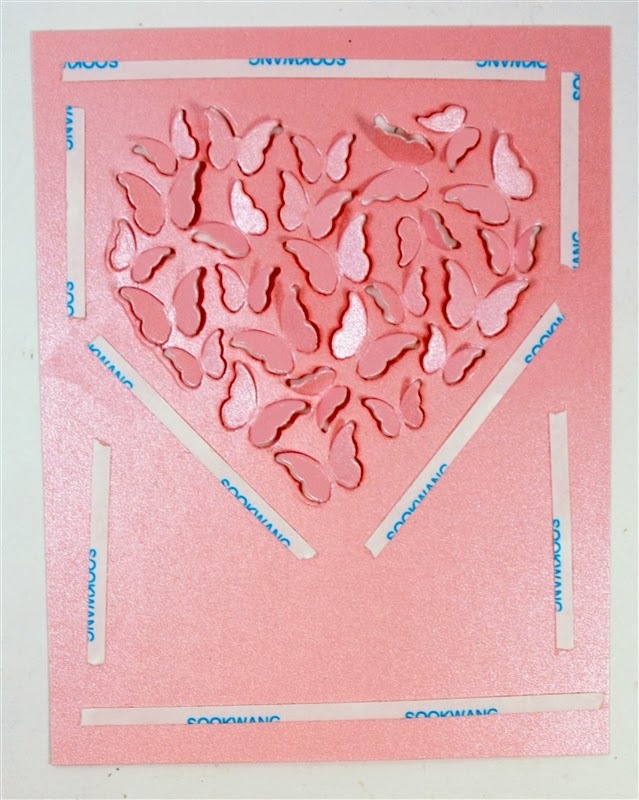 By putting the adhesive on the pink piece I could be sure that the top layer would be easy to place over the butterflies. The butterflies are pretty but the three dimensional effect was rather subtle with just a white card base behind the image. I tried putting a piece of gold metallic cardstock behind the butterflies and if really made them pop! 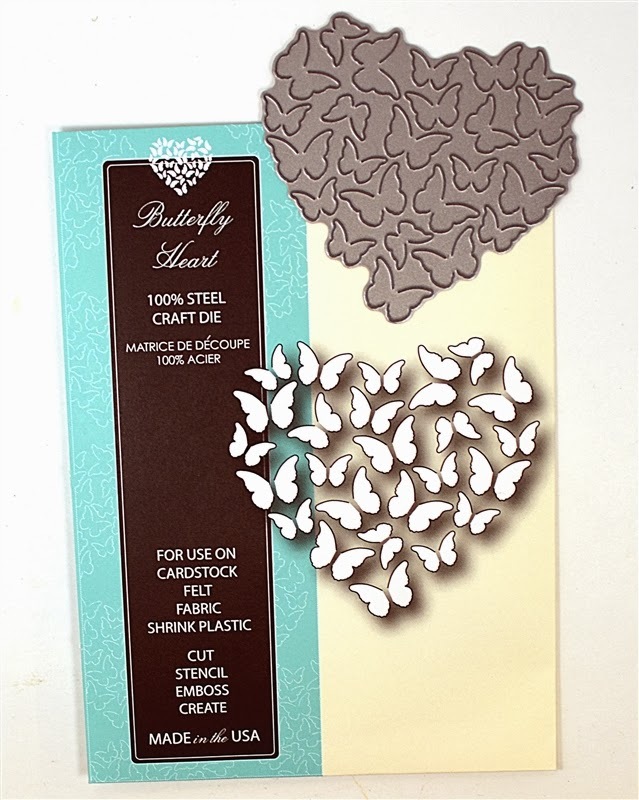 The butterflies need to have their wings lifted after cutting and you might not want to mail this card unless you put it in a box - otherwise the wings might get crushed down. Here are the pieces of the card front - the base is white cardstock from Papertrey Ink. I really like using this for card because it is very thick. The back of the folded card can take the weight of this multi-layered front. After I added the full front to the card all I needed was a sentiment. 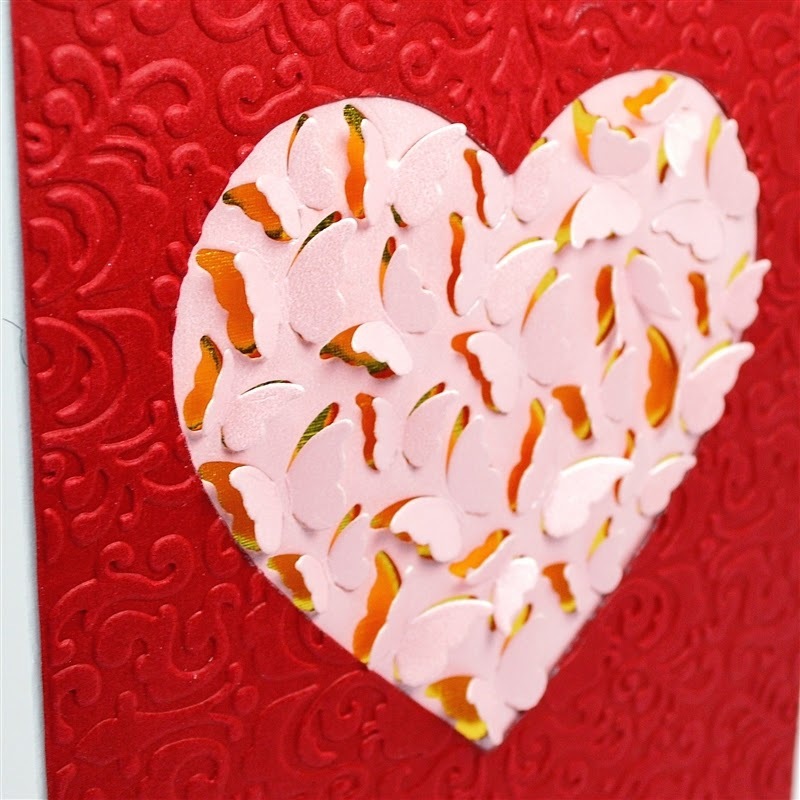 I decided to pull out an older Cricut cartridge called Sentimentals and look for a quick cut for this card. I found the "For You" on page 64 of the handbook. It has a shadow layer so it worked for my card. (I could have created the sentiment with my Silhouette but sometimes a quick Cricut cut is just faster and easier). 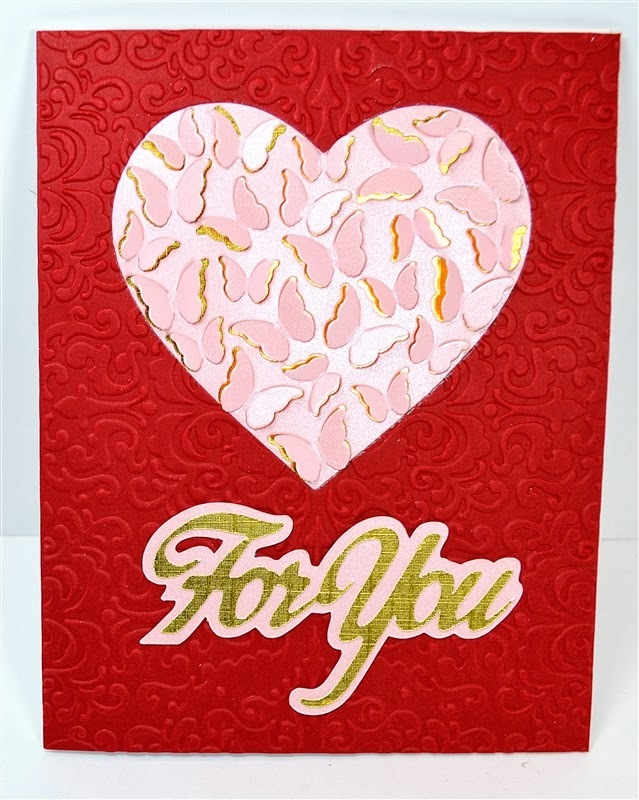 I reversed the colors for the sentiment, using gold for the top layer and the pink shimmer for the shadow. If you don't have a clear layout ruler, you might want to pick one up. They can be found in art supply stores or craft stores and usually cost less than $10, depending on the length. 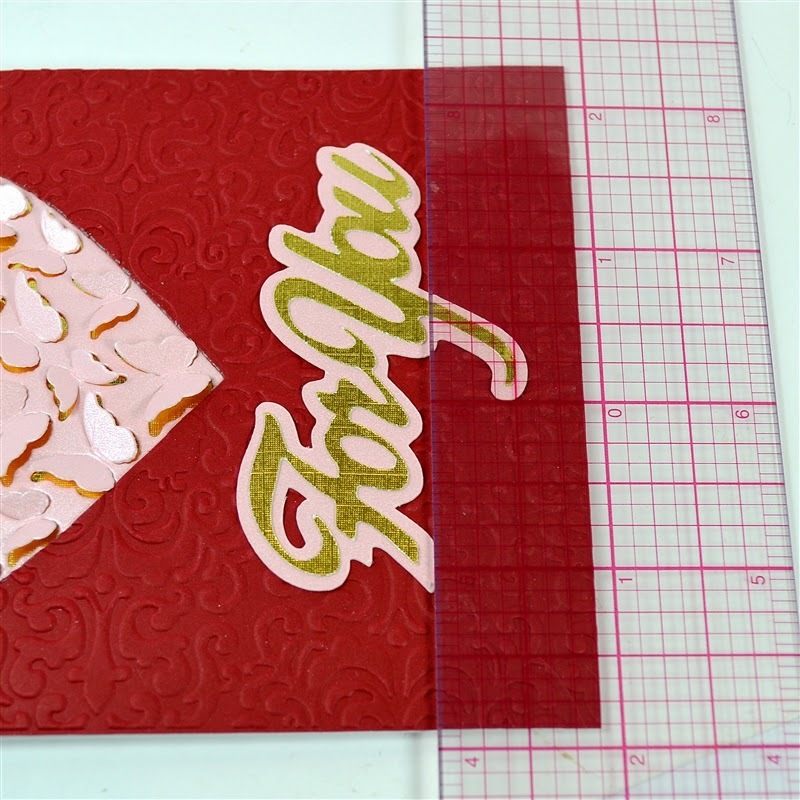 I use mine all of the time for paper scrapbook pages and a shorter ruler is great for keeping things lined up on a card. I adhered the sentiment directly to the card instead of using a foam dot to raise it as I often do. I didn't want the words to take away from the fluffy butterfly wings. 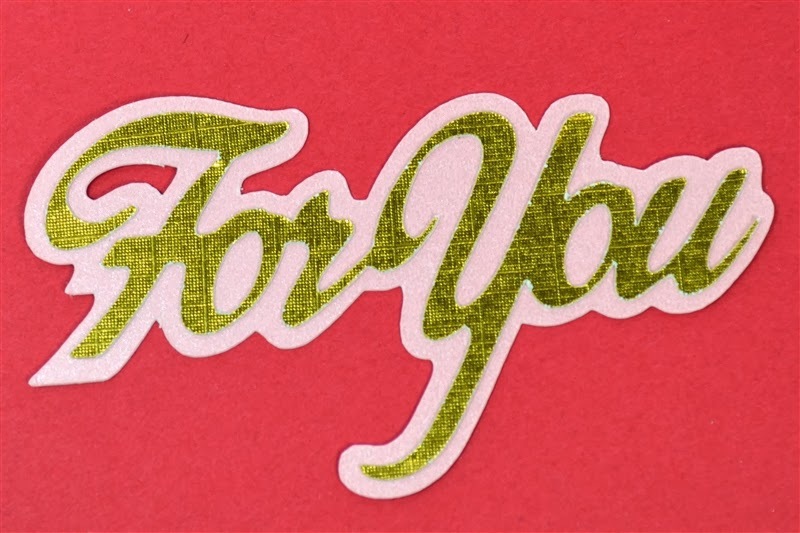 The words are slightly off center because I wanted to line up the slant of the "F" with the angle of the heart. This also gives me a bit of extra room if I decide to add a ribbon to the side of the card. It is very hard to capture the effect of the shimmer and metallic cardstock in a photo. This darker photo gives you a better idea of what it looks like in person. 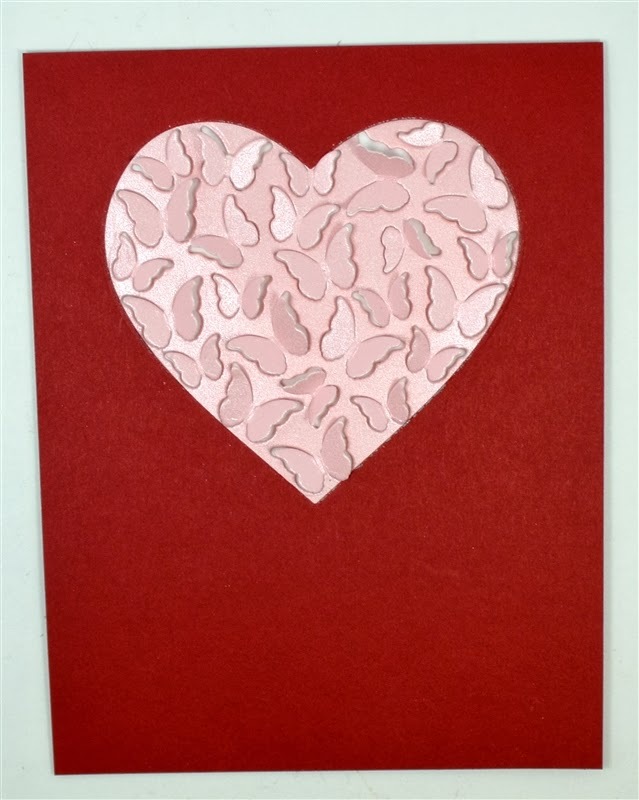 I haven't added a sentiment inside but an appropriate one (though slightly corny) might be "my heart flutters for you!" Thanks for all of the good wishes for my sister - she is out of the hospital and recuperating at home. We that our new kitty might end up being called "Dorabella" - we just have to try it out for a few more days. We like it because she is adorable and Dorabella sounds like it could be Italian for adorable - or maybe it's Italian for "doorbell?" Beautiful Dora is a purrfect name for your new kitty! I love Dorabella, and I'm sure that she will, too! 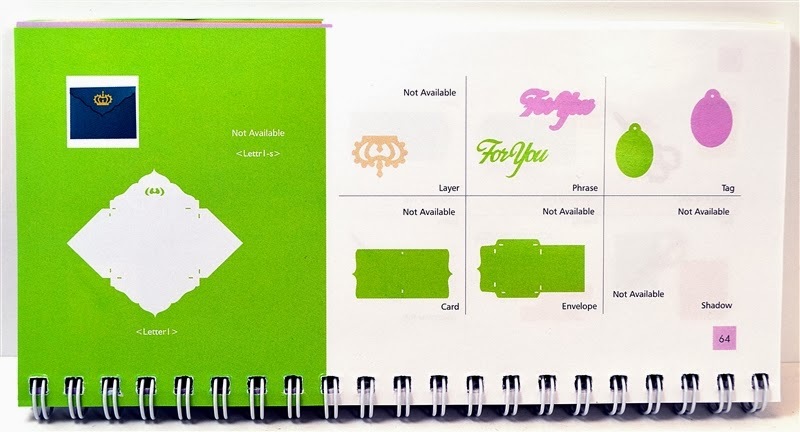 Your card is amazing, and I'm happy to see a Cricut cut, since that's what I have (but not that cartridge). Thank you for the inspiration. I love seeing you get back to basics. This card is great! This card is amazing. You make it sound so easy to make, but it does take some work. Love reading your blog and thank you for some great ideas. 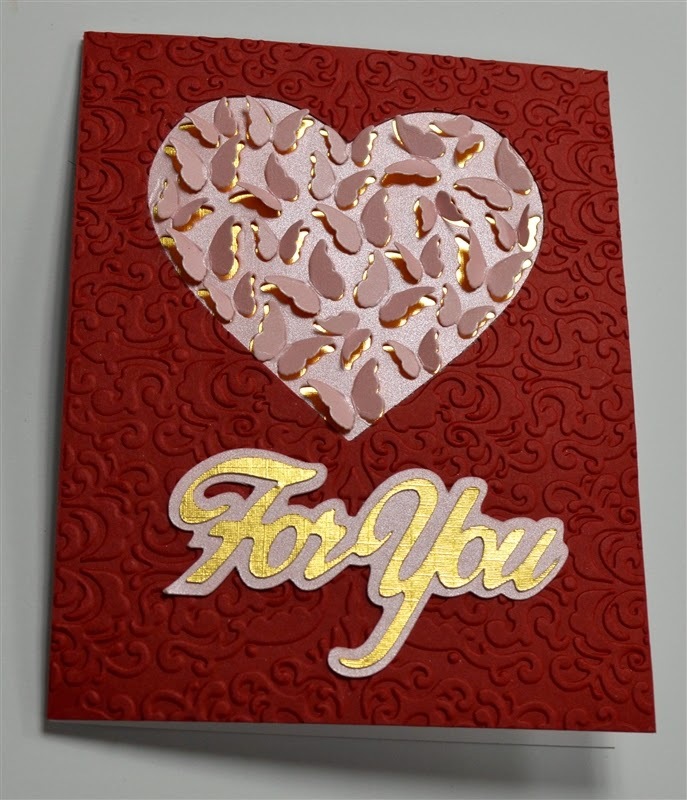 Beautiful card, What machine do you use to cut Memory Box dies? Love the effect of the fluttering butterflies with the gold background. Very pretty!